Physio In Motion therapists have a wide range of experience and additional education to help you with any type of injury or illness. From mild sprains and strains to post operative rehabilitation following joint replacement surgery to spinal chord injuries we have the experience you are looking for. Osteoporosis Canada defines it as a disease characterized by low bone mass and deterioration of bone tissue, which can lead to increased risk of fracture. Osteopenia is less severe than osteoporosis. Known as “The Silent Thief”, osteoporosis leads to bone deterioration that can occur over a number of years without any symptoms. Often the first sign of osteoporosis is a fracture and by that time the disease is more advanced and less treatable. No single cause has been identified but there are many risk factors. 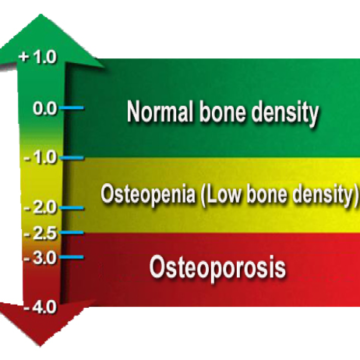 All men and women ages 65 and older should have a bone density test. Postmenopausal women and both men and women aged 50 and older with any of the risk factors identified above should talk to their doctor about a bone density test. Osteoporosis is managed with Medications, Nutrition and Exercise. A diet with adequate calcium and vitamin D is important as these are the building blocks for bone. Exercise and physical activity are important for bone health. Impact and weight bearing activity are the most important. A registered physiotherapist with extra training in the management of osteoporosis is an important part of the team when managing this disease. Making a commitment to a physiotherapist supervised exercise program will ensure that you are doing the right exercises in the correct way to achieve optimal results. Review our blog post about physiotherapy and osteoporosis for more information. Pronounced (plan-ter-fash-ee-eye-tus), plantar fasciitis is a common cause of pain on the bottom of the foot. The plantar fascia is connective tissue on the bottom (or plantar surface) of the foot. When this connective tissue is strained or irritated you will experience pain on the bottom of your foot when you stand or walk. Your Physio In Motion physiotherapist will talk to you about your work and leisure activities as well as the pain your are experiencing. Your physiotherapist will talk to you about the importance of giving your feet an opportunity to recover by cutting back on aggravating activities. They will show you a number of stretches and exercises to perform several times a day. Finally they will talk to you about shoe choice and incorporating custom made foot beds or orthotics into your current footwear. With this conservative approach most of our clients report a significant improvement in pain in a short period of time. If pain does not resolve your physiotherapist will talk to you about additional treatment options such as icing, ultrasound, taping or compression sleeves that support the plantar fascia. Vertigo is the feeling of dizziness or feeling off balance. In contrast to the moment of lightheadedness you might experience when standing up too quickly, Vertigo does not resolve quickly. Other symptoms that commonly present with vertigo include nausea and vomiting, ringing in the ears and headaches. How does Physiotherapy help Vertigo? Physio In Motion offers specialized vestibular rehabilitation. A physiotherapist with additional specialized training in this area will provide an assessment and discuss a treatment plan with you. The vestibular system has very little ability to repair itself and instead you must compensate for the damage. A vestibular physiotherapist can help you to compensate as quickly as possible and start feeling better again. Watch our video blog about vestibular rehabilitation here. Osteoarthritis is the most common chronic condition of the joints. OA affects millions of Canadians. The most commonly affected joints are the knees, hips, low back and neck, and the fingers and toes. OA occurs when the slippery and cushioning cartilage of the joint breaks down. Without the cushioning and ease of movement provided by cartilage, joints become stiff, sore and swollen. How does Physiotherapy help Osteoarthritis? Your Physio In Motion physiotherapist can help you address risk factors for arthritis and provide options to relieve the pain you may be experiencing already. For example, there are a number of excellent products to relieve the pain of OA of the knees. Unloading knee braces have proven to be very effective for our clients and provide almost immediate relief. Don’t allow the image of a knee brace discourage you. Knee braces have gone from bulky and uncomfortable to lightweight carbon and aluminum works of art. They help by slightly unloading the joint space where damaged cartilage is causing pain. The immediate improvement in pain is remarkable. Our clients using OA knee braces consistently report that their quality of life is dramatically improved. 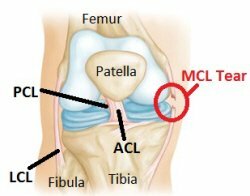 What is an ACL or MCL Injury? An injury to one (or more) of the four ligaments of the knee can be classified as a grade 1-3. Grade 1 – Is a sprain or strain of the ligament without laxity. Each ligament performs a specific job in the knee and damage to each ligament results in a series of specific symptoms. If your physician suspects damage to a ligament of the knee they will typically request an MRI. You will need to see a physician after an injury to the ligaments of the knee. Some injuries will recover on their own or with physiotherapy. Other injuries will require surgical repair. Physiotherapy will almost always be recommended after surgery. Where physiotherapy is indicated your Physio In Motion physiotherapist will assess your injury and limitations and develop a treatment plan with you. As your injury heals your physiotherapist will let you know when it’s safe to make gradual increases to your activities levels. They may also talk to you about a ligament brace to support your injured knee during recovery. A brace may also prevent further injury to your damaged knee. Whiplash is a non-medical term used to describe the injuries that occur to the neck in a rapid acceleration – deceleration type of injury. Whiplash presents as a complaint of neck pain, stiffness or tenderness and decreased range of motion. This condition is most often associated with car accidents and specifically rear end collisions, although any forceful blow to the head or body can cause whiplash. The rapid acceleration – deceleration forces that cause whiplash can also cause concussions. In fact, we commonly see the symptoms of concussion closely associated with a whiplash injury. How does Physiotherapy help Whiplash? Treatment of whiplash is no longer the immobilization collar you might have seen on television or in the movies. Today your physiotherapist will help to get you moving as soon as possible with gentle exercises. Early and active intervention are shown to have a much better outcome. Treatment in cooperation with your family physician may also include pain relief medications of the NSAID variety, heat, icing, traction or ultrasound. Different patients respond differently to treatment and what works for your neighbor may not work for you. Parkinson’s is a chronic, neurodegenerative disease. Parkinson’s disease results from the loss of cells in the brain that produce the neurotransmitter dopamine. Dopamine is the chemical responsible for transmitting signals within the brain that control the coordination of movement. Loss of dopamine results in the poor control of motor movements. The exact cause of Parkinson’s is currently unknown. It is believed that a combination of environmental and genetic factors lead to a diagnosis of Parkinson’s. Exercise plays a HUGE role in the management of Parkinson’s. Excellent exercises included but are not limited to yoga, tai’chi, rock steady boxing, cycling / spinning, water exercises. Most exercises help the brain retrain in some capacity. Recruiting the help of an experienced physiotherapist is the best way to get the most from your exercise program. Your physiotherapist will help you address specific problems such as weakness, balance issues, poor endurance and trouble walking. Exercises in the management of Parkinson’s need to include LARGE and POWERFUL movements that are also purposeful and meaningful. Let our experienced neurophysiotherapists show you how to regain control of Parkinson’s. What is Multiple Sclerosis MS? MS is classified as an autoimmune disease of the central nervous system. The disease attacks myelin, the protective covering of the nerves. Myelin is required for the transmission of information through nerve fibres. Overtime, scar tissue replaces myelin where damage has occurred and the transmission of nerve impulses through the nerve fibres is inhibited. Strokes are a leading cause of death and adult disability in North America. A stroke occurs when blood flow to an area of the brain is cut off. If brain cells are deprived of oxygen they begin to die. A stroke can result in the permanent loss of movement, speech and cognitive functions such as memory. TIA is an acronym for Transient Ischemic Attack. A TIA is often called a mini-stroke and they can be a warning that a larger stroke is imminent. TIAs occur when a small blood clot briefly blocks an artery in the brain. A TIA doesn’t result in permanent damage to brain cells. The recovery following a stroke ranges from partial to complete. Part of the recovery occurs naturally and spontaneously. The balance of your recovery will take some time and effort. Physiotherapy after a stroke helps you relearn motor skills and other abilities as the damaged areas of the brain adapts. Your rotator cuff is the group of muscles and tendons that support your shoulder joint. They keep the head of the humerus sitting in the shallow socket of the shoulder. A rotator cuff injury occurs when the muscles or connective tissue of the shoulder joint are damaged. Rotator cuff injuries are typically associated with repetitive overhead motions at work or with sports. With rest many people recover from mild rotator cuff injuries on their own. Physiotherapy may be recommended for more stubborn of longer lasting issues. Your physiotherapist will teach you exercises that will help to strengthen the rotator cuff muscles and improve the flexibility of the joint. You will be taught how better posture when lifting and performing repetitive tasks can prevent further rotator cuff pain. Spinal Cord Injury (SCI) refers to damage to the nerves inside the spinal canal. These are the nerves that our housed inside the bones of the spine. Spinal cord injuries vary from a completely severed spinal cord to a damaged but intact spinal cord. The extent of the damage and the height of the injury or lesion affect the level of disability the individual might experience. Trauma such as a motor vehicle or sports accident is the most common cause of SCI. Other causes include medical conditions or other insult to the spinal cord. Physiotherapy cannot repair a spinal cord injury; however, your physiotherapist can help you regain as much function as possible. Your physiotherapist will also help you to safely adapt to new mobility aides such as a wheelchair. When a joint is damaged or degenerated beyond repair joint replacement surgery is considered. The surgery is perform by an orthopedic surgeon. The surgeon will replace your damaged joint with an artificial replacement. Hips and knees are the most commonly replaced joints. Physiotherapy after a joint replacement will focus on strengthening the muscles that support the new joint. The goal is to speed healing and help you return to your activities of daily living as soon as possible. The neck or cervical spine is made up of bones, muscles, connective tissue and nerves. The anatomical design of the neck and they tremendous load of holding up the weight of your head can result in injury. In the event of a neck injury, the abundance of nerve pathways in the neck can result in pain in many areas below the neck. Neck pain is typically a mild strain and will resolve on its own in a few days. More sever cases of neck pain such as a whiplash disorder following a car accident will require intervention for the best possible outcome. Can Physiotherapy Help with Neck Pain? If rest and ice / heat are not providing the relief you need Physiotherapy can help you with your neck pain. Your physiotherapist will teach you gentle exercises to maintain your strength and range of motion. They may also provide treatment to help you manage your neck pain. Did you know that low back pain is one of the most common reasons for visiting a doctor? Most Canadians will experience low back pain at some point in their lives and the cost to the health care system and the economy is staggering. The back is a complex structure made up of bones, muscles, nerves and other “soft tissues”. Because you rely on this structure for almost every move you make, it is very important to keep your back healthy. Did you know that 80% of Canadians will experience at least one bout of significant back pain in their lifetimes? The prevalence of back pain makes this one of the most common reasons for health care visits and missed work. The associated health care costs and the costs of lost productivity are staggering. Regular low-impact aerobic activities such as walking and swimming can increase your strength and endurance and allow the muscles of your back to function better. Strengthening the muscles of the abdomen and the back (core strengthening exercises) will help support your back like a natural brace. Improving your flexibility in the hips and upper legs aligns the pelvic bones to prevent or improve back pain. Smokers have diminished oxygen levels in their spinal tissues, which can hinder healing. Being overweight puts an extra strain on your back muscles. If you’re overweight, trimming down can prevent back pain. Use good posture while standing and sitting (including while driving and working at the computer). Use proper lifting techniques; keep your back straight up and down and lift with your knees. Hold loads close to the body and avoid lifting and twisting at the same time. Proper body mechanics while sleeping is often overlooked; if you wake up stiff and sore in the morning consider purchasing a new mattress. Look for mattress with good support; an extra firm mattress is not necessary. If back pain is limiting your ability to complete day-to-day activities, see your physiotherapist or family doctor to discuss treatment options. For most people being in good physical condition or “in shape” is the best back pain prevention. Regular aerobic exercise and regular strengthening of the spine stabilizing core muscles plus flexibility training are critical for maintaining a healthy and pain free back. The best exercises are the ones that have been hand select for you by an appropriate health professional such as a Physio In Motion therapist. A trained health and rehabilitation professional will assess your needs and recommend exercises to meet your needs. Your posture is the way that you hold your body against gravity when sitting, standing, walking or laying down. Good posture occurs when your body positions are optimized to promote balanced musculature and reduce strain on the connective tissues of the body. Good posture is also visibly pleasing. Generally speaking we are born with good posture and balanced musculature. Over time our posture can change as our bodies adapt to our activities, lifestyle and environment. Adaptations can have both positive and negative impacts on our posture and body mechanics. For example, someone working in a physical occupation may develop increased lean muscle mass as they adapt to the demands of their job. Conversely, office workers tend to develop forward heads and rounded shoulders as their bodies adapt to the demands and extended sitting position associated with working on a computer. Can physiotherapy help with bad posture? Physiotherapists are the perfect healthcare professional to help you address bad posture and the underlying causes. A physiotherapist has the background knowledge to understand how your environment influences posture. We have therapists with the experience you need. Let us know how we can help you.